The Wok Cafe goes for a more understated name that doesn’t rely on a play on words that incites a smirk or an outright laugh. Take Wok and Roll or Wok and Run, where the puns are taken to another level. Don’t get me wrong, they’re hilarious – I chuckle every time. We’ve caught fleeting glimpses of the Wok Cafe on our way to the fish market but never looked at it long enough to realize that it is much more than just a cafe. Actually, it’s not really even a cafe at all. It’s a Chinese restaurant that serves some pretty great dishes that include your typical crowd pleasers like General Tao chicken, sweet n’ sour pork and crispy noodles but more importantly, some authentic ones – look out for the menu written in Chinese only at the last page. If you don’t know how to read the characters, just ask. I’m sure the servers would be more than willing to explain. One of these items is the fish belly, crab and squid soup we ordered to start. The texture is admittedly unique, with the fish belly and squid tasting a little more jelly-ish and rubbery that you would expect (this is good) and the soup just between thick and thin in consistency. With a spoonful of black vinegar mixed in, this soup is not quite like any other. 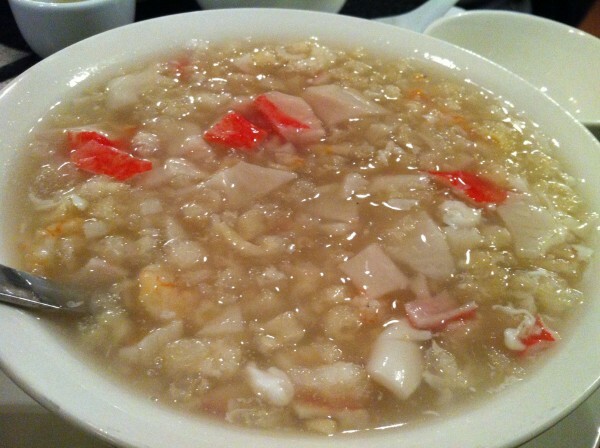 I love this soup – it’s an old favorite that’s served at almost any Chinese restaurant and if you haven’t tried it before, I say go for it. We had a red curry and coconut beef dish that was served along with some red and green peppers. They amount of peppers was overkill and for some reason the red ones tasted much fresher and crunchier than the green ones… There were easily at least ten slices of green peppers left on the plate when we left. Luckily, that didn’t take away from the tastiness of the protein. The eggplants were served hot sufficiently mushy – these have a strong taste and are harder to eat alone but on top of rice, they’re just right. Lastly, we had an order of Thai seafood which came with crab meat, shrimps, peppers, onions and a variety of other veggies. I noticed that all the crab meat served was artificial which I wasn’t a big fan of. Either deal with that or order dishes that don’t include the crab. All in all – definitely check this place out if you’re in the West and are at a loss of where to go out for a quick and easy dinner. Tags: Beef, Chinese, Coconut, Crab, Dinner, Dollard-des-Ormeaux, Eggplant, Fish Belly, forkandtell, Lunch, Soup, Wok Cafe.